Soak tamarind and salt in water and squeeze out the juice completely by adding two cups of water little by little. Peel onion and garlic and keep it aside. In a kadai put the oil and when it is hot add mustard seeds. When it splutters, add fenugreek and then add the garlic flakes, onions and curry leaves. Fry for few seconds. 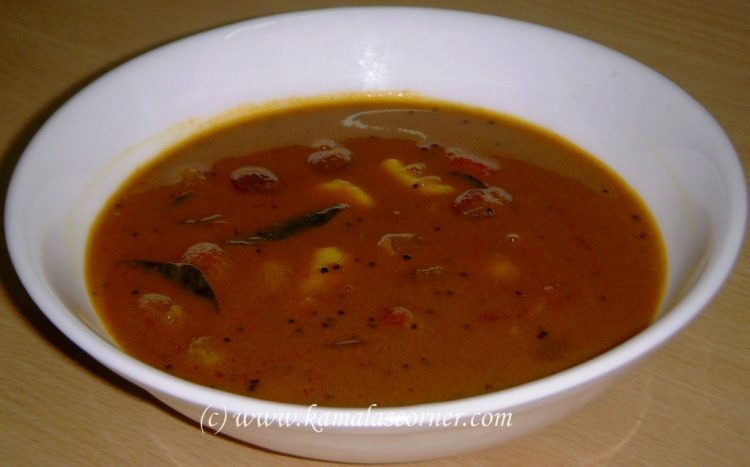 Add sambar powder and turmeric powder and mix it well. Then add tamarind water. Mix well. Cover with lid and cook on medium flame till the Kuzhambu is thick.